It is said that well-kept hands and pretty, healthy nails are a pleasure to behold. Moreover, for me, it’s such a delight to even decorate them. The idea is to be creative. Such a style statement speaks so much about how you feel! One doesn’t need to be in their teens to be flaunting it, really. I mean, there are so many simple designs to choose from that a lady of any age can easily go for it. I wear a new nail art design almost every season. Besides, I do get inspired by special occasions, take for instance, weddings and Diwali. For me, around that time, it is all about glitter and bright colors. Here are some simple designs that can add gorgeousness to your outfit, mood and overall looks. If you are a beginner, I suggest start with something which is easy perhaps two complementary colors (more like colorful French nails). With time, when you have become an expert in nail art designs or atleast more receptive to the idea (by having convinced yourself that just-a-plain-nail paint-look can get boring at times), then go for experimentation. 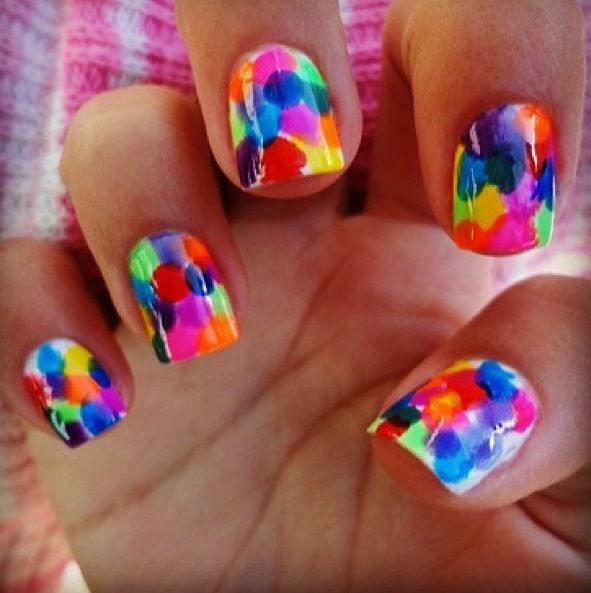 Opt for stripes, leopard skittles, contrasts, sparkles, polkas, stamping, lace-effect, tie & dye, rainbow burst and water marbles. There is so much to cherry-pick from..
To avoid paint from drying out on the edges of the nails (i.e. skin area), apply petroleum jelly (read Vaseline) right before you get down to applying the base coat. Don’t be too generous though. Use a cotton swab to rub it around the corners of your nails. I recommend going for a white nail polish as the basecoat to enhance your nail color. Application of french manicure can never be easier! Take a rubber band and twist it around your fingertip. 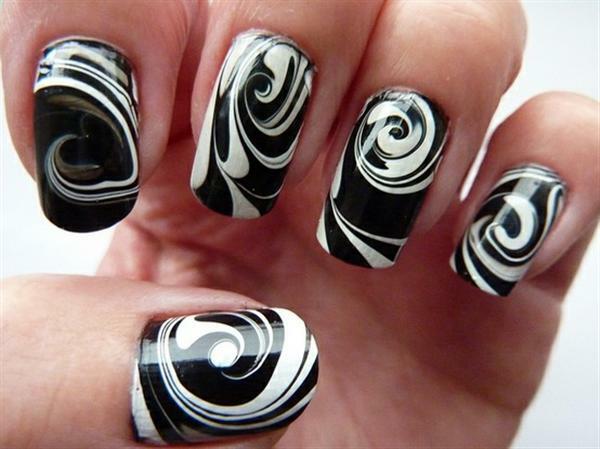 What it does is that it ensures the paint is effortlessly applied only on the tip of your nail. If you are in a hurry, a hair-dryer comes handy. It will help the polish dry faster OR especially in summers, you can dip your nails in ice water after painting them. Use a tweezer/plucker to place extra-tiny nail art accessories on your nails. I do go by America’s famous actress and singer, Dolly Parton’s saying, “my nails are my rhythm section when I’m writing a song all alone. Someday, I may cut an album, just me and my nails”. So, what’s your nail rhythm for this festive season?